Coffee table books about salmon flies are ten-a-penny, but you don’t get to read so many about patterns that are dressed without using a vice, which is why this one caught my eye. The era that all the fly dressers are interested in is, inevitably, the heyday of what has become known as the “fully-dressed” pattern, which occupied less than 50 years, or about a tenth of the period that we know salmon have been sought with a fly - and who can blame ‘em, because some stunning works of art were created in that scant five decades. The complex creations of the Victorian dressers scaled the heights of creativity in the last quarter of the nineteenth century, only to vanish in the chaos of the Great War, after which Europe had to turn its mind to more practical things than how many Blue chatterer feathers could be squeezed onto a single hook. 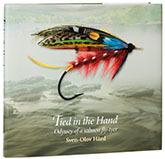 While hair-wings took over, a few old die-hards still fished fully-dressed patterns and, amazingly, Hardy continued to tie flies for selected customers - in the hand - right through to the early 1980s, around the time when the American-led revival in “authentic” traditional salmon fly tying began to gather steam. Most readers will know these revival patterns, which are gorgeous, but are tied with very different techniques to the salmon flies the Victorians knew and consequently look very different. The revival patterns not only pay homage to a different aesthetic to the hand-tied originals, but take advantage of methods which are only practicable if you use a vice. Here we have a book which showcases salmon flies that have been tied in the hand by a dresser with a long experience of doing things that way and who is confident enough to see past the modern trends and dress patterns the way their creators knew them. I am not saying that the last 30 years of classic salmon fly dressing development should be thrown out the window, but I do think that anglers should have a chance to see traditional flies as the Victorians knew them - and if you want that, then this is the book you need. The 200 pages are lavishly illustrated with many full-page shots of the author’s dressings and the book is divided into five parts. The first 26 pages are a potted, “parade of authors” history of salmon fly dressing, which is best described as broadly correct (for example, I don’t think there is any evidence that Grant invented the Spey cast and I was surprised to hear that Jimmy Wright was a vicar). After that comes a short personal history of why Sven-Olov got into dressing salmon flies in the hand and from that point on I can only describe this as the most charming technical book I have read in a long while. The author pays extended homage to Hardy and its fly dressers over the next 28 pages, outlining the reasons why the Alnwick firm’s products influenced him so heavily, and at the end of it, you would have to be made of stone not to be won over. The meat of the book runs from page 85 to 145 and deals with materials and methods, following which the author gives a step-by-step example of how to tie a Blue Doctor in the hand - ironically, this is the one place where the book is crying out for illustrations, but gets hardly any - and the last 50-odd pages are an immensely collection of vignettes of famous salmon rivers, the author’s experiences and a sunset epilogue. I thoroughly enjoyed Tied in the Hand and if you don’t buy it for yourself, it would make the most fantastic gift. However, I should point out that the one thing readers will notice the minute they open the book is that the way the illustrations have been processed and printed has left them a little flat, so all the colours are noticeably muted. The effect isn’t unattractive, but just be mindful if you set out to copy any of the wonderful patterns Sven-Olov has created.